A huge site adjacent to the Bruckner Expressway (from which cars could be directed to parking without hitting the city grid), astride the Amtrak line, close to the water, and easily served by both subways and Metro-North, seems to be all plusses. Not simply would construction be minimally disruptive, it would provide a strong symbol for neighborhoods that are among the city’s poorest. The easy relationship with the athletic facilities on Randall’s Island would also be a positive should the city win the Olympics. 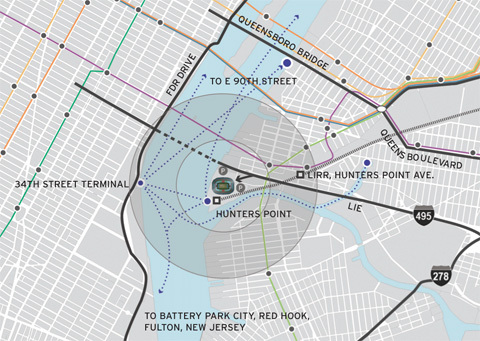 A second potential site in the same vicinity is the nearby intermodal railyard opposite Manhattan.